Oh the sweet days of Summer are almost here. We have one week left of school then we can relax. I love this cover of this dvd because it makes me think of my four boys and the sweet memories we will make this summer. We are looking forward to old fashioned days of sleeping in, staying up late with movies and books, swimming and lots of lemonade. 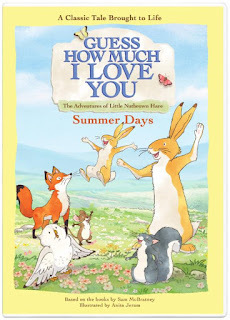 Guess How Much I Love You Summer Days is perhaps one of the loveliest dvds. It is based on the book series Guess How Much I Love You about a bunny - Nutbrown Hare. This dvd brings many sweet friends to the story and it is delightful to watch. Enjoy these adventures based on the classic picture book that has sold more than 30 million copies worldwide, written by Sam McBratney, illustrated by Anita Jeram and published by Walker Books. Keeping love as the major theme, each adventure is set against the backdrop of a season with this collection focusing on summer. On a hot summer day, Little Nutbrown Hare and friends try to have some quiet time by the river but they have trouble staying still. Only when they do manage some quiet time, they experience the variety of life the river has to offer. Then, it's time to celebrate Little Field Mouse's birthday! Little Nutbrown Hare wants to give her the perfect birthday gift. Enjoy these summer adventures and more with Little Nutbrown Hare and friends! We love to go to the NC mountains and have a picnic off the parkway. Just so beautiful up there and the scenery is amazing. I have planted my Monarch garden for the spring and now we have so many butterflies everyday visiting and laying eggs on them now. I love going to water parks and traveling.